In 2016, Malek and his mom came to the United States with the assisance of the International Organization for Migration, beginning a very long process of seeking resettlement in the states.After years of working hard to provide for her family, Majeda, wife and mother of two, decided it was time to start a family business doing what she most loved to do — cooking. 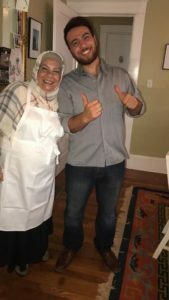 With the help of her son, Majeda started selling home-cooked Syrian food at the Clarkston Community Center on a monthly basis. They named their catering business Suryana Cuisine, emphasizing that their service offers both a product and an experience. Suryana Cuisine transports its guests, through a palette of new flavors to their beloved and missed homeland. Looking into the future, the mother-and-son business would like to expand by opening a kitchen and offering job opportunities to refugees in the community. Suryana’s business vision includes providing better work experiences for refugees, with special attention to refugee women. Finally, as the business grows, Majeda and Malek hope to share Syrian food and culture to more people within and beyong their new community in Georgia.